Journeys of the heart, mind and body through space, time and consciousness. Small-town-to-big-city stories, colonies of microbiota living inside us, our brain as our most intimate home – a home moved and inspired by rhythm and working with our hands. What does it cost us to leave home? We nodded our heads and felt pangs of nostalgia, thinking about homes we’ve left either in time or distance. We grieved over the lasting impacts of cancer that affect a home – who hasn’t been touched? We were moved by art, dance and song. We considered citizenship and what it means for the right to vote for both young and old. We travelled to Jamaica, Uganda, Mars and back, and experienced joy and wonder at the magnificence of our Earth home from the eyes in space. Curiosity about the smallest of the small, about what we don’t yet know about the universe, and about what we do know about human relationships – all of this gave us more insight into the home within and around us, and propels us to find out more. We were privileged to take a step out of our everyday and invited to share in the passion of the presenters at TEDxWaterloo on March 27, 2013. It is seriously hard to sum up what I experienced at my first TEDx event – what I’m feeling is so much more than the facts and information. I actually had a dream last night that was quite vivid –Dr. Alison Lister was explaining how the team at CERN arrived at the standard model of physics. I’m sure most of the “science” and equations that sprung up in my dream were made up by my subconscious. However, I find it interesting that my brain stored a seed of information about a topic that I know very little about, and decided to elaborate on it. I think this is a good example of how a person is affected by a TEDx event – life, how we think about it and seek to understand it, feels more open and accessible and we’ll never really be the same. I was also reminded about how home isn’t just about ourselves. Home for me has always included and been more meaningful because of the people who share in it. 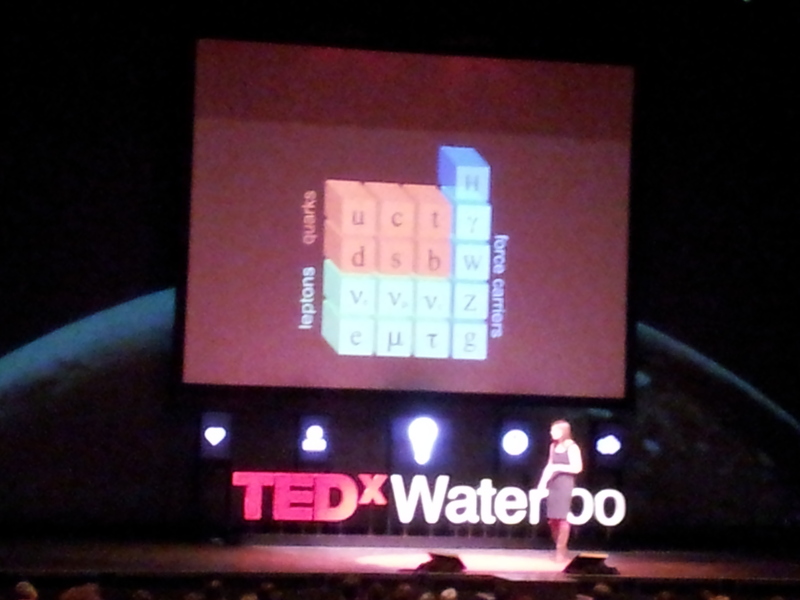 I saw a very clear representation of my various homes – past present and future – through the people who I was able to spend time with at TEDxWaterloo. John, Tricia and Saibal – representing Wellesley, where I live with my family. Colleagues from my old work represented my past and the foundation of where I came from. Connecting with new friends represents my ongoing journey of finding my true career path, a “home” and sense of belonging for Hot Quill. Before I close off, I’d like to share with you the image below. 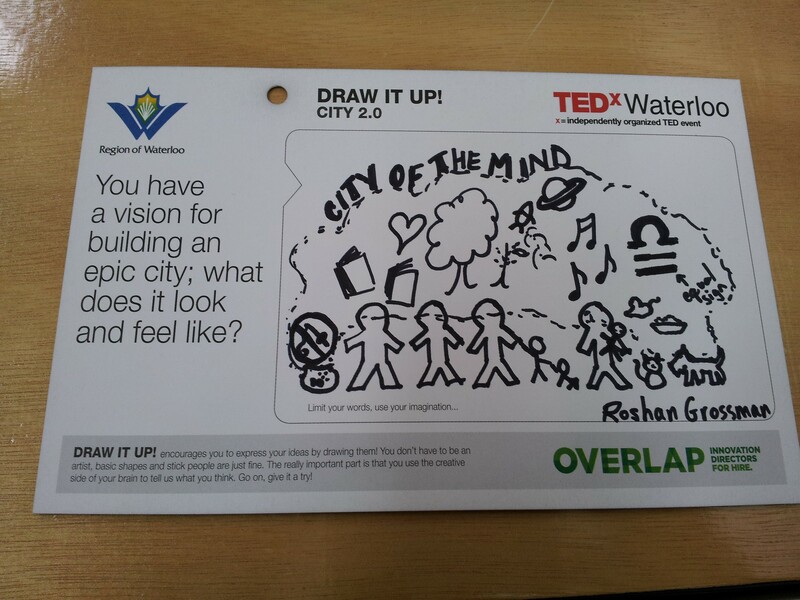 At TEDxWaterloo, we were asked to visualize different aspects about “City 2.0.” This is my response about an epic city of the future – a city of the mind. What would you draw? I’m curious to hear your thoughts on all of the above. Please share in the comment section below, or find me on Twitter, Facebook or LinkedIn. If you want to see some of my live-tweets from the event, you can find Women Powering Technology on Twitter. Thank you so much for being the voice of Women Powering Technology on Twitter for this event. As always, your tweets were insightful and gave those of us not able to be there a glimpse into the event. When you do get around to googling quantum mechanics, can I ask you to give me the 411 – maybe in 140 characters or less…pretty please? Julia! Thanks so much for reading my post!! I’m thrilled that you enjoyed it…I know how busy it’s been for you over the past couple of weeks so it means a lot to me that you made time for this. As I’ve said before, I count it a privilege that you asked me to live-tweet on behalf of WPT at this year’s TEDxWaterloo event.